Tonight I want to impart on you one of the greatest lessons I have learned when it comes to taking care of children. That’s it. 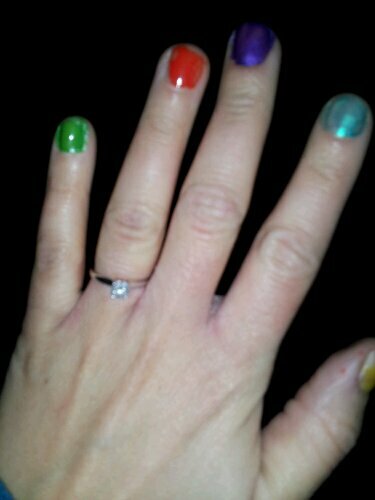 Super simple and super effective. Now that’s not to say you should let them eat ice cream for dinner and jump off the roof. But if it is safe, not destructive, and will do no harm to anyone else (which I realize is all the same thing), then by all means say yes. Children nowadays are constantly told no. They can’t do finger painting because it will get on their clothes. The toys can’t leave the playroom because it will ruin the aesthetic of the house. Well I say pooey. Let kids be messy. Let them explore. And rid yourself of the power struggle that comes when you say no too often. Yes is a beautiful powerful word to children. It tells them you trust them, believe in them, and will honor their true needs and desires. It tells them you love them. Play and life lesson all on one? I think so. 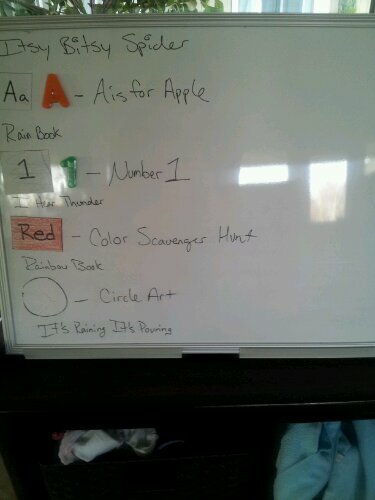 For Christmas, I bought Little Miss and Baby Miss a felt/magnetic dry erase board. I started this week using it for “circle times” with Baby Miss. On days when we have no place to be (gymnastics, music class, etc.) circle time can consist of many parts: songs, books, art, felt board activities. On busy days, it may only include going over that week’s letter, number, color, and shape; and one song and book. I’m not very strict about it, but I am working on making it a habit to sit down and do some type of structured material with her everyday around the same time. Yesterday, we created our first letter and number signs. For each new letter and number, we will be making a sign and posting it on the wall. Soon, Baby Miss will be able to see numbers 1-10 and the entire alphabet each and every day. 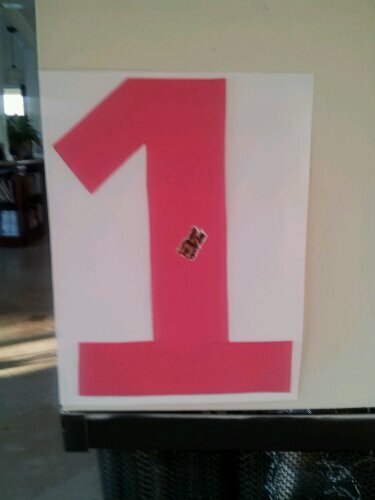 Our number signs consist of a large number cut out from construction paper. Then she puts a corresponding number of objects on that number. This week, for the number 1, she decided on one dog sticker. We will also be using buttons, dry pasta, beans, yarn, etc. for the different numbers. Our letter sign consists of a large letter cut out of construction paper, which I first let her color on; then we will add something that starts with that letter. For A, we did apple prints. 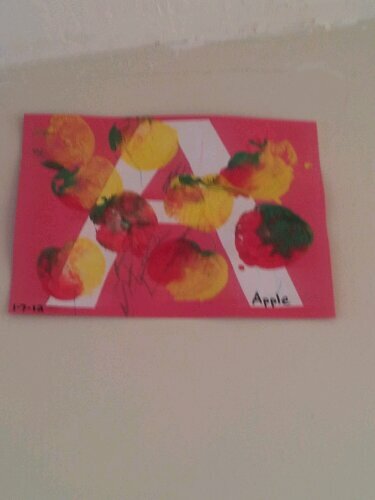 Just cut an apple in half, stick in paint, and use them to stamp the paper. Both girls really liked this activity. Each week I will be sharing with you the various activities that I do with each girl. You can join me by following along on the 2013 Education Calendar and using my themed activities. For as young as I am, I’ve worked for a long time with children. I’ve worked with a wide variety of ages, in different settings, and with all types of kids. And, I’ve been to a LOT of birthday parties. It’s Baby Miss’ 2nd birthday party this weekend, which has gotten me in a “present” state of mind (pun completely intended) :). It always baffles me how many absolutely terrible presents kids get. And no, I’m not talking socks and underwear. I’m talking toys. There are a lot of ridiculous toys available today; mountains of plastic, no creativity needed, and poorly made. It drives me bonkers. But, I am here to save you from all craziness. I’ve put together a list of fabulous toys for all ages, as well as list of my favorite retailers so you can find your child’s new favorite toy! There are five different types of toys; Dramatic Play, Active Play, Puzzles and Games, and arts and music, and sensorial. I’m going to give you some ideas in each category. Ready? Here we go! scarves, stuffed animals, puppets, pretend food and kitchen supplies, dolls (of all cultures), dress up clothes (my favorite place to get these especially for school age kids is Goodwill or Salvation Army), play house, doll house, cars and trucks, mailbox, plastic or wooden animals and barn (or equivalent). Active Play: Indoor or outdoor, kids need to move! bikes, trikes, jump ropes, balls (of all sizes, materials, textures, etc), tumbling mats, hoops, tunnels, scooters, bean bags, bowling sets, horseshoes, hula hoops, ribbon dancers, balance boards, mini trampolines, cones, domes, hopscotch mat, mini parachute, yoga mat and book or dvd, skates, etc. Candyland, Tic Tac Toe (travel set), The Storymatic, Charades, Tangrams, Colorforms, 3D puzzles or models (for older kids), Twister, Guess Who, Connect Four, memory games, dominoes, Chutes and Ladders, Go fish, puzzles of all sorts, etc. Music of all types, instruments of all types, twirly skirts (as Little Miss calls them), scarves, ribbon dancers, playdough and rollers, cutters,etc; stamps and ink, markers, crayons, paper, watercolors, glue, construction paper, paint, art smocks, googly eyes, pipe cleaners, tissue paper, glitter glue, foam, felt, con-tact paper, scissors with all different edges, paper plates, beads, pom poms, stickers, rhinestones, popsicle sticks, chalk, etc. You could make your own “craft kit” by throwing lots of different supplies in a super cute basket or box. Trust me- they’ll love it! Blocks (wooden, foam, all colors and types), moon sand, playdough, construction sets, legos, magnet sets, threading boards, lacing beads, a light table and accessories, water and/or sand table, water toys, felt board and accessories, wooden pattern blocks and picture cards, clay, Floam, etc. Now there are two other gift ideas that I have that don’t fit under either category. One is, books. I can not say enough about how important it is for you to read to your child every day… ok, end of my speech. 🙂 Second, would be activities. These could be coupons for ice cream, ice skating, trips to the zoo, museums, and more. Children love getting out and exploring new things as well as spending time with their parents. http://www.melissaanddoug.com They have amazing puzzles, games, pretend play toys, blocks, and tons more. http://www.uncommongoods.com/ They have toys, books, puzzles, and great gifts for teens; things that you can find no where else! And let me just say: I am not paid by or sponsored by any of these websites or products, I just really like them.